Hypertrophic cardiomyopathy (HCM) is an inherited heart muscle disorder defined by left ventricular hypertrophy in the absence of abnormal loading conditions. Left ventricular outflow tract (LVOT) obstruction is present in about one-third of patients at rest, and another 40% develop LVOT obstruction during exercise. Obstructive HCM (OHCM) patients have major risk of developing clinical symptoms, arrhythmias, and clinical events. LA volume, measured by two-dimensional echocardiography (Echo), is the most accurate measure of LA size, because little variations in the linear dimension are often associated with large variation in volume as the result of asymmetric LA remodeling. Indeed, it is well known that LA volume index (LAVi) is associated with a major risk of atrial fibrillation (AF) and supraventricular arrhythmias, and it is also a marker of diastolic dysfunction, diastolic HF, and major clinical events. To date, the clinical meaning of LAVi, measured during stress Echo, in HCM patients has not yet been investigated. This study sought to evaluate the correlation between LAVi, measured rest (rLAVi) and stress (sLAVi), and arrhythmias in HCM patients. In this observational, prospective study, we collected data from a cohort of 51 consecutive patients affected by HCM, followed from July 2014 to March 2017 at Cardiomyopathy Clinic, Monaldi Hospital, Naples, Italy. HCM was diagnosed by two-dimensional Echo, in the presence of unexplained maximal wall thickness ≥15 mm in index cases or ≥13 mm in their family members. We performed complete clinical evaluation, electrocardiogram (ECG), and standard and stress Echo in all patients, following a common protocol. Echocardiographic measurements at rest and during exercise were carried out using a Vivid E9 ultrasound system, GE Healthcare, Chicago, Illinois, United States. Data were stored digitally for review and analysis using EchoPAC software, GE Healthcare, Chicago, Illinois, United States. Bicycle exercise Echo was performed during upright posture. The patient pedals against an increasing workload at a constant cadence. The workload is escalated in a step-wise fashion while imaging is performed. Although imaging can be done throughout the exercise protocol, in most cases, interpretation is based on a comparison of resting and peak exercise images, including chamber dimensions (atria and ventricles), systolic and diastolic function, and tissue Doppler parameters. According to international recommendation, LAVi was determined using the area–length method. rLAVi was considered as the mean value of three different measures, calculated at rest, in accordance with the American Society of Echocardiography guidelines. In the same way, sLAVi was considered as the mean value of three different measures calculated at the peak of bicycle exercise. Patients were followed up periodically, every 6–12 months, according to the decision of physicians. Patients who refused follow-up visits were not considered in the analysis of endpoints. Follow-up was programmed until the visit closest to 18 months. At each visit, Holter monitor report or implantable cardioverter defibrillator interrogation, was recorded. At follow-up, the following composite endpoints were considered: arrhythmias (ARRHYT) endpoint (AF; supraventricular tachycardia [SVT]; nonsustained ventricular tachycardia [ns-VT]; sustained-VT; ventricular fibrillation; SCD) and HF endpoint (significant worsening of NYHA class and left ventricular ejection fraction, hospitalization, and death for end-stage HF). Thus, we analyzed the correlation between rLAVi and sLAVi and the composite ARRHYT endpoint. Normally distributed and skewed continuous data were presented as mean ± standard deviation and median ± interquartile range, respectively, whereas percentages were used for categorical data. Comparison between groups was based on Student's t (for paired and unpaired data), Mann–Whitney U, Fisher's exact, or Chi-square tests, when appropriate. Thereafter, given current lack of generally accepted cutoffs for LA volume in these patients, the study population was also stratified, first in quartiles, and then dichotomized in two groups, according to the median value of LAVi (≤ or > of the median value). This stratification was performed both for sLAVi and rLAVi. Intraobserver variability was good for both sLVAI and rLAVi (intraclass correlation coefficient =0.60, confidence interval [CI]: 0.3-0.89; 0.87, CI 0.7-0.93. In addition, univariate logistic regression analyses were performed to identify association between LAVi (at rest and stress) and the ARRHYT endpoint. We tested four models, where the dependent variable was the ARRHYT endpoint, and the independent variable was sLAVi or rLAVi as continuous variables or as dichotomic variables (in model A: sLAVi as dichotomic variables, in model B: sLAVi as continuous variables, in model C: rLAVi as dichotomic variables, and in model D: rLAVi as continuous variables) We compared these four models using Akaike Information Criterion (AIC) as major criteria. For the best model, a receiver operating curve estimation was used to calculate C-statistics for composite endpoint. Thus, sensitivity, specificity, and negative and positive predictive values of the model were calculated. We did not consider multivariable analysis owing to the exiguity of our sample size. RStudio Team (2015). RStudio: Integrated Development for R. RStudio, Inc., Boston, MA; URL: http://www.rstudio.com/. was used for statistical analysis. P < 0.05 was considered statistically significant, with all tests being two sided. We studied 51 consecutive patients (mean age: 39.41 ± 17.9 years; male = 39, female = 12). The mean follow-up was 1.71 years, and the median follow-up was 1.82 years. Clinical characteristics of the study population are reported in [Table 1]. Stress Echo findings are reported in [Table 2]. At the peak of exercise, we observed a significant increase of LAVi, left ventricular outflow tract gradient, tricuspid S wave, and tricuspid annular plane systolic excursion. 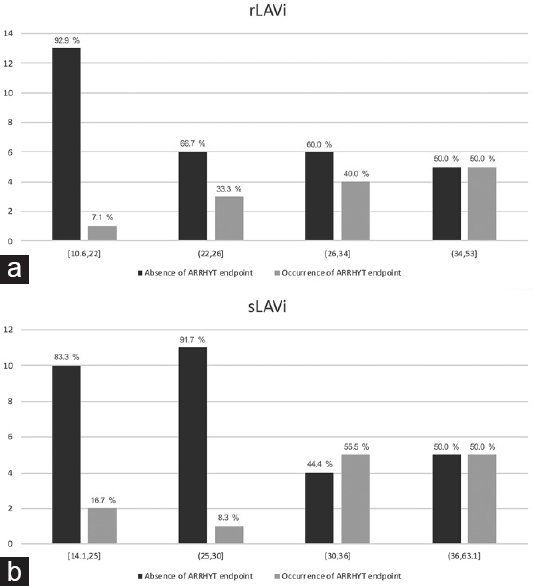 sLAVi was significantly increased in 46 patients (90.2%) compared to the rest (mean values: 31.16 ± 10.15 mL/m2 vs. 28.05 ± 9.89 mL/m2, respectively, P < 0.001). The follow-up was completed in 43 patients (84%) [Table 3]. The composite HF endpoint occurred in five (11.6%) patients. 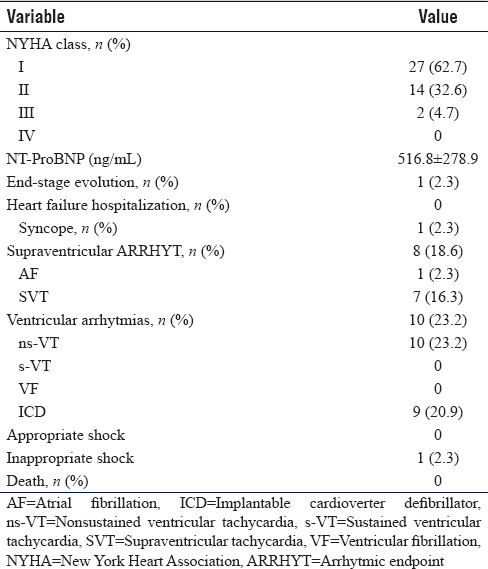 Eight patients (18.6%) showed supraventricular arrhythmias, whereas 10 patients (23.2%) had ventricular arrhythmias and 13 patients (30.2%) presented atrial and ventricular arrhythmias (ARRHYT endpoint). 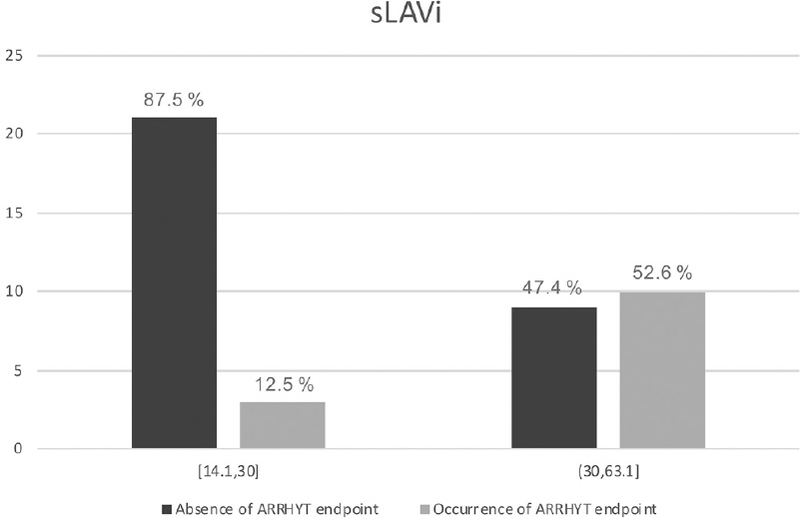 Among groups in different rLAVi and sLAVi quartiles, patients in the 3rd and 4th ones had a significant higher occurrence of ARRHYT endpoint, particularly for sLAVi [Figure 2]. On analysis of the four models (A, B, C, and D), the AIC values were, respectively, 48.37, 52.78, 50.37, and 50.76. Hence, the model A (sLAVi as independent variable, dichotomized according to values > or ≤ of the median value, 30 mL/m2) was proved to be the most accurate. Patients with sLAVi >30 mL/m2 had a significantly increased incidence of ARRHYT endpoint compared with patients with sLAVi ≤30 mL/m2 (10 out of 19, 52.6% vs. 3 out of 24, 12.5%, P value = 0.00768), being with odds ratio of 7.78 (CI = 1.88, 41.37) and the relative risk of 4.2 (CI = 1.34, 13]) as shown in [Figure 3]. 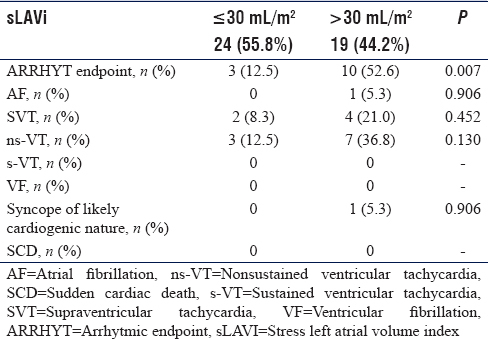 The distribution of ARRHYT endpoint between patients with sLAVi ≤ and >30 mL/m2 is summarized in [Table 4]. C-statistics, sensitivity, specificity, positive predictive value, negative predictive value, and predictive accuracy of this cutoff are reported in [Table 5]. LA size increases in response to the following two main pathophysiologic conditions: pressure overload (e.g., mitral stenosis and increased left ventricular filling pressure due to diastolic and/or systolic dysfunction) and volume overload (e.g., mitral regurgitation [MR] and left-to-right shunts). Thus, increased LA volume may be considered as an adaptive response in order to maintain left ventricular stroke volume and cardiac output. However, continued LA enlargement may result in decreased LA compliance, reduced reservoir and contractile pump functions, and eventually increased incidence of atrial arrhythmias. In patients with HCM, the cause of LA enlargement is commonly related to systolic anterior movement-related MR and elevated left ventricular filling pressure. An increased LA volume in HCM is associated with greater hypertrophy, more diastolic dysfunction, and higher filling pressures. Compared with LA diameter, both LA volume and LA strain represent more powerful markers of new-onset AF. Particularly, in those patients with normal LA diameter, a LA volume ≥37 mL/m2 and LA strain ≤23.4% improve the prediction of new-onset AF in HCM patients (C-statistics 73% and 83%, respectively). However, the role of sLAVi in patients with HCM is still unknown. There is increasing interest for atrial size/function during exercise in physiology and different disease conditions. The dynamic of LA size in normal individuals and athletes heart has been previously investigated., During physical exercise, the increase of cardiac output, despite a reduction in filling time (due to higher heart rate), seems to be related to a progressive atrial remodeling, an increase in reservoir function, and a consequent increased ventricular preload. These phenomena can be exacerbated in a peculiar disease model such as HCM, where dynamic MR, LVOT obstruction, and even diastolic dysfunction may play a crucial role during exercise. To our knowledge, this is the first report of the value of sLAVi, measured at the peak of exercise, as a simple and noninvasive parameter to improve risk stratification of arrhythmias in patients with HCM. In this study, we enrolled 51 consecutive HCM patients who underwent stress Echo following a common protocol. The main finding of this study was the correlation between sLAVi and arrhythmic events (both atrial and ventricular) in patients with HCM, with an incremental risk in the population with sLAVi >30 mL/m2 (predictive accuracy: 72.1%, C-statistics: 0.7346, and negative predictive value: 87.5%). 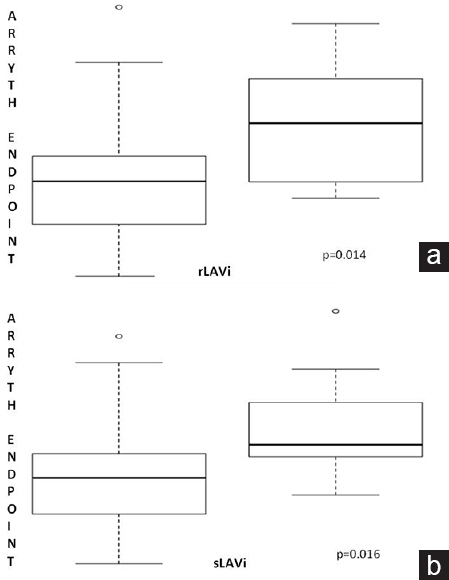 Furthermore, in our study, LAVi at stress performed better than LAVi at rest as a predictor of arrhythmias (AIC: 48.37 vs. 50.37, if dichotomized according to the median values). In a recent meta-analysis, Liu et al. 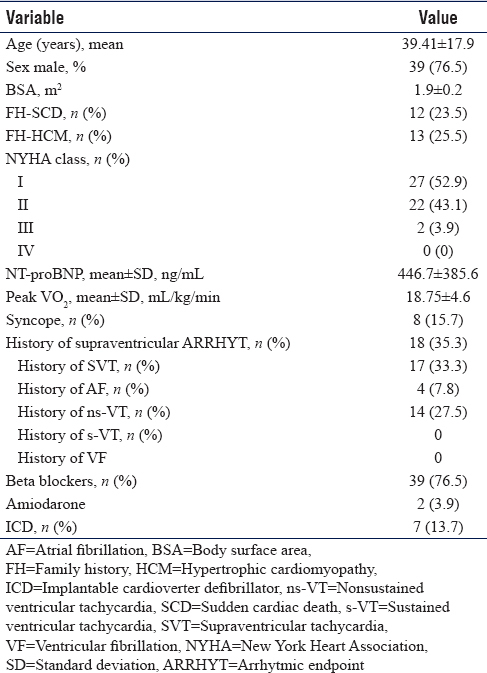 demonstrated that AF and ns-VT were independent predictors of cardiovascular death. The independent role of sLAVi as a predictor of arrhythmias, but also of unfavorable outcome, should be further reinvestigated in prospective, large-scale, collaborative studies. Our findings are based on a single-center study with a relatively small sample size. 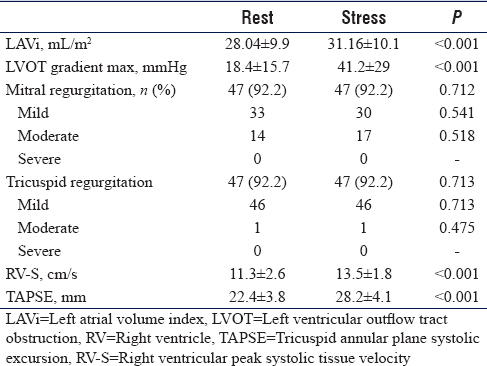 Multivariate models on a significant number of HCM patients, and considering rest/stress parameters (i.e., LAVi, MR, and LVOT obstruction), are warranted to define the independent prognostic role of LAVi. Our study is the first study suggesting the feasibility and potential utility of sLAVi in HCM. We showed that patients with LAVi >30 mL/m2 had an increased risk of arrhythmias when compared to patients with HCM. This suggests that sLAVi could be a potential and additional useful marker of arrhythmias in patients with HCM. Further studies are needed to verify the direct relation between sLAVi and arrhythmias and its possible role as an independent predictor of prognosis. Authors/Task Force members, Elliott PM, Anastasakis A, Borger MA, Borggrefe M, Cecchi F, et al. 2014 ESC guidelines on diagnosis and management of hypertrophic cardiomyopathy: The task force for the diagnosis and management of hypertrophic cardiomyopathy of the European Society of Cardiology (ESC). Eur Heart J 2014;35:2733-79. Wigle ED, Rakowski H, Kimball BP, Williams WG. Hypertrophic cardiomyopathy. Clinical spectrum and treatment. Circulation 1995;92:1680-92. Olivotto I, Cecchi F, Casey SA, Dolara A, Traverse JH, Maron BJ, et al. Impact of atrial fibrillation on the clinical course of hypertrophic cardiomyopathy. Circulation 2001;104:2517-24. Maron MS, Olivotto I, Betocchi S, Casey SA, Lesser JR, Losi MA, et al. Effect of left ventricular outflow tract obstruction on clinical outcome in hypertrophic cardiomyopathy. N Engl J Med 2003;348:295-303. Elliott PM, Gimeno JR, Tomé MT, Shah J, Ward D, Thaman R, et al. Left ventricular outflow tract obstruction and sudden death risk in patients with hypertrophic cardiomyopathy. Eur Heart J 2006;27:1933-41. Maron BJ, Maron MS, Wigle ED, Braunwald E. The 50-year history, controversy, and clinical implications of left ventricular outflow tract obstruction in hypertrophic cardiomyopathy from idiopathic hypertrophic subaortic stenosis to hypertrophic cardiomyopathy: From idiopathic hypertrophic subaortic stenosis to hypertrophic cardiomyopathy. J Am Coll Cardiol 2009;54:191-200. Maron BJ, Ommen SR, Semsarian C, Spirito P, Olivotto I, Maron MS, et al. Hypertrophic cardiomyopathy: Present and future, with translation into contemporary cardiovascular medicine. J Am Coll Cardiol 2014;64:83-99. Yang WI, Shim CY, Kim YJ, Kim SA, Rhee SJ, Choi EY, et al. Left atrial volume index: A predictor of adverse outcome in patients with hypertrophic cardiomyopathy. J Am Soc Echocardiogr 2009;22:1338-43. Nistri S, Olivotto I, Betocchi S, Losi MA, Valsecchi G, Pinamonti B, et al. Prognostic significance of left atrial size in patients with hypertrophic cardiomyopathy (from the Italian registry for hypertrophic cardiomyopathy). Am J Cardiol 2006;98:960-5. Losi MA, Betocchi S, Barbati G, Parisi V, Tocchetti CG, Pastore F, et al. Prognostic significance of left atrial volume dilatation in patients with hypertrophic cardiomyopathy. J Am Soc Echocardiogr 2009;22:76-81. Tani T, Yagi T, Kitai T, Kim K, Nakamura H, Konda T, et al. Left atrial volume predicts adverse cardiac and cerebrovascular events in patients with hypertrophic cardiomyopathy. Cardiovasc Ultrasound 2011;9:34. Lester SJ, Ryan EW, Schiller NB, Foster E. Best method in clinical practice and in research studies to determine left atrial size. Am J Cardiol 1999;84:829-32. Lang RM, Badano LP, Mor-Avi V, Afilalo J, Armstrong A, Ernande L, et al. Recommendations for cardiac chamber quantification by echocardiography in adults: An update from the American Society of Echocardiography and the European Association of Cardiovascular Imaging. J Am Soc Echocardiogr 2015;28:1-39.e14. Tsang TS, Abhayaratna WP, Barnes ME, Miyasaka Y, Gersh BJ, Bailey KR, et al. Prediction of cardiovascular outcomes with left atrial size: Is volume superior to area or diameter? J Am Coll Cardiol 2006;47:1018-23. Masri A, Kanj M, Thamilarasan M, Wazni O, Smedira NG, Lever HM, et al. Outcomes in hypertrophic cardiomyopathy patients with and without atrial fibrillation: A survival meta-analysis. Cardiovasc Diagn Ther 2017;7:36-44. Leung DY, Boyd A, Ng AA, Chi C, Thomas L. Echocardiographic evaluation of left atrial size and function: Current understanding, pathophysiologic correlates, and prognostic implications. Am Heart J 2008;156:1056-64. Pagel PS, Kehl F, Gare M, Hettrick DA, Kersten JR, Warltier DC, et al. Mechanical function of the left atrium: New insights based on analysis of pressure-volume relations and Doppler echocardiography. Anesthesiology 2003;98:975-94. Sen-Chowdhry S, Jacoby D, Moon JC, McKenna WJ. Update on hypertrophic cardiomyopathy and a guide to the guidelines. Nat Rev Cardiol 2016;13:651-75. Guttmann OP, Pavlou M, O'Mahony C, Monserrat L, Anastasakis A, Rapezzi C, et al. Predictors of atrial fibrillation in hypertrophic cardiomyopathy. Heart 2017;103:672-8. Tsang TS, Barnes ME, Gersh BJ, Bailey KR, Seward JB. Left atrial volume as a morphophysiologic expression of left ventricular diastolic dysfunction and relation to cardiovascular risk burden. Am J Cardiol 2002;90:1284-9. Debonnaire P, Joyce E, Hiemstra Y, Mertens BJ, Atsma DE, Schalij MJ, et al. Left atrial size and function in hypertrophic cardiomyopathy patients and risk of new-onset atrial fibrillation. Circ Arrhythm Electrophysiol 2017;10. pii: e004052. Gabrielli L, Bijnens BH, Brambila C, Duchateau N, Marin J, Sitges-Serra I, et al. Differential atrial performance at rest and exercise in athletes: Potential trigger for developing atrial dysfunction? Scand J Med Sci Sports 2016;26:1444-54. Schnell F, Claessen G, La Gerche A, Claus P, Bogaert J, Delcroix M, et al. Atrial volume and function during exercise in health and disease. J Cardiovasc Magn Reson 2017;19:104. Prior DL, La Gerche A. The athlete's heart. Heart 2012;98:947-55. Liu Q, Li D, Berger AE, Johns RA, Gao L. Survival and prognostic factors in hypertrophic cardiomyopathy: A meta-analysis. Sci Rep 2017;7:11957. Picano E, Ciampi Q, Citro R, D'Andrea A, Scali MC, Cortigiani L, et al. Stress echo 2020: The international stress echo study in ischemic and non-ischemic heart disease. Cardiovasc Ultrasound 2017;15:3.